In the face of state repression and blatant fraud, Hondurans are demanding their right to a democratic election. On November 26, Hondurans went to the polls to select the country’s next president. It had been eight years since a US-backed coup toppled the left-leaning president, Manuel Zelaya, and ushered in conservative rule. Squaring off were the incumbent National Party leader, Juan Orlando Hernández, and the center-left opposition candidate, Salvador Nasralla. As election returns rolled in, Nasralla jumped out to a five-point lead over Hernández. But that gap slowly evaporated and Hernández began to pull ahead as concerns surfaced about possible electoral fraud. International observers soon called on Honduran voting authorities to conduct a recount. On December 4, the National Party–controlled electoral commission announced that Hernández was now besting Nasralla by a small margin. However, the Supreme Electoral Commission still has yet to declare a winner and the possibility of a broader recount has not been ruled out. The uncertainty surrounding the election has produced widespread demonstrations in the country’s capital city of Tegucigalpa and even prompted Honduran police forces to refuse government orders to crack down on protesters. To discuss the context for the volatile elections and the political crisis still unfolding, Jacobin spoke with Dana Frank, a historian at the University of California, Santa Cruz, and an expert on the country. What was the political climate in Honduras like coming into the elections? How did President Juan Orlando Hernández find himself running for reelection? There is a long context, starting with the 2009 military coup that deposed democratically elected president Manuel Zelaya. That opened the door to the post-coup regime that has run over the rule of law, and opened the door to massive incursions of organized crime, gangs, and drug traffickers who are embedded at the very top of the government. That long arc of the post-coup horror set the stage for President Juan Orlando Hernández. Hernández was a key backer of the coup and voted for it as a member of congress in 2009. Then as the president of congress in 2012, he led the so-called technical coup, in which four members of the Supreme Court were overthrown. He then won the presidency in 2013 in what was itself an election marked not only by fraud, but also the assassination of over two dozen activists, the greatest number from the Liberty and Refoundation (LIBRE) opposition party. Hernández has now been president since 2014. The LIBRE center-left party rose out of the massive resistance to the coup. LIBRE is the first successful center-left party in Honduran history. It may have won the 2013 election under the candidacy of Xiomara Castro, Manuel Zelaya’s wife. The situation in Honduras under the reign of Hernández has been disastrous, part of what produced a growing number of unaccompanied children fleeing to the United States. In 2015, journalists revealed that Hernández and his party had stolen as much as $90 million from Honduras’ national health service, effectively bankrupting it and causing the deaths of at least three thousand people.That money was then spent on his and his party’s campaign. Great outrage and marches in the streets erupted in response. But Hernández continued to consolidate his power. He controls congress, the Supreme Court, the military, the police, the attorney general, and the Supreme Electoral Tribunal, which controls the balloting process. The Honduran constitution says that you cannot run for re-election, and that even advocating for re-election as the sitting president or vice president is a criminal act. But in 2016 the Supreme Court ruled that the constitution did not apply and that re-election was acceptable. The Supreme Court had no legal authority to do so. In Honduras, you would need to have a full amendment process like in the United States. But there are no brakes on Hernández’s power, so he has proceeded with this criminal campaign for re-election, adding to his incredible record of overthrowing the rule of law. The general elections were held on November 26. Can you describe what’s transpired between then and now, and the ups and downs that we’ve seen? There’s an opposition candidate named Salvador Nasralla, and he is the candidate of the Opposition Alliance Against the Dictatorship. The alliance is a partnership between the center-left LIBRE party, and Nasralla, who was the leader of the conservative Anti-Corruption Party, or PAC. The PAC is largely made up of conservatives fleeing the two traditional parties in horror of their mass corruption. So LIBRE has united in alliance under the candidacy of Nasralla. Coming into the November 26 elections, it was widely assumed that Hernández would win, simply because he controlled the electoral process and his party a long history of committing fraud. The electoral commission then stopped releasing results altogether, later claiming that the computers had shut down. This led to massive alarm from Hondurans and from all over the world about what was going on. The commission didn’t release any results for two days and then started to release results 5 percent at a time. Gradually, by the end of the week, the results showed that Hernández was ahead by 1.5 percent. They have now said that the results show that Hernández has the most votes, although they have not officially declared him to have won the election. We are now at a very intense moment of outrage against this pattern that so clearly seems to indicate fraud on the part of the National Party. In response, there have been tremendous protests and demonstrations in the streets by Nasralla and the Opposition Party. We’ve seen road blockages, all kinds of peaceful protests, and also provocateur activity that many are saying is being elicited by the ruling party, in which people who are not of the opposition have been looting and burning things. This was the pretext for martial law, which was declared on December 1, and tremendous state repression of peaceful protesters. A curfew has been imposed. Most terrifyingly, state security forces are using live bullets against peaceful protesters from the opposition. The number of confirmed deaths at the hands of security forces is at least fourteen, of whom twelve were killed by the military police, according to COFADEH, the leading Honduran human rights group. Then, on December 4, four hundred special police forces from the elite Cobras unit refused to work. They said that they would not repress the Honduran people, that they were of the Honduran people too and that their families had asked them not to do this and refuse to work. The Honduran government is trying to cast this as just a rebellion about pay and has thrown pay raises at all of the police — clearly trying to buy them off, but also because it knows that this is an important elite unit, not just any unit, and other police have also refused to obey orders if it involves repressing the opposition. This is absolutely unprecedented in Honduran history. We do not know if it is spreading, but it appears to be. It shows the deep illegitimacy of this government at the grassroots level. I think right now it is very clear, to international observers as well as the Honduran people, that the election is being stolen and the government is cracking down with terrifying repression, and there are no signs of it letting up. 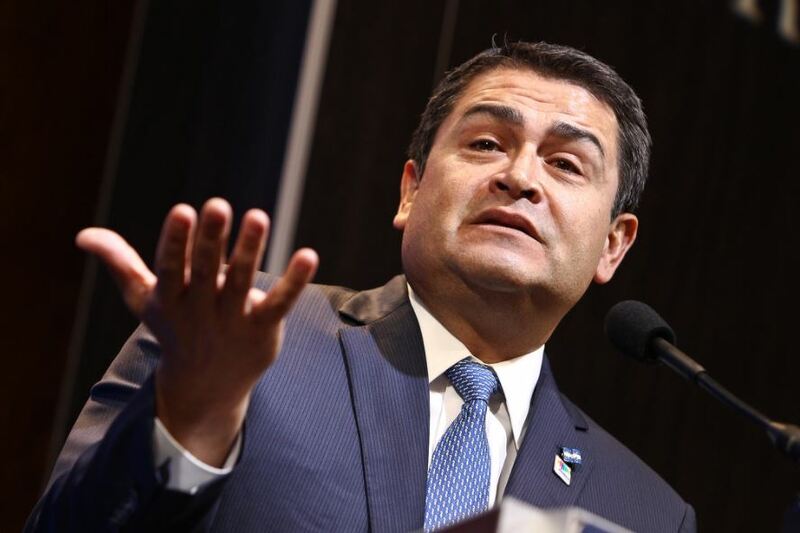 This week it was also revealed that just two days after the election, the United States certified that Honduras has been fighting corruption and supporting human rights. What does this say about the US government’s perception of the election? It’s outrageous that the US State Department chose to officially certify that human rights conditions placed on the Honduran government in the appropriations bill had been met. That decision was in the can before the elections, but the fact that right as the election fraud was beginning to play out, they would certify, is a very aggressive act by the Trump administration and by those who are calling the shots on US policy in Honduras. The United States has a long history of supporting the post-coup regime, including that of Hernández — although I don’t think they can entirely control their monster. Going into the elections, the United States was very supportive of Hernandez. For example, they trotted out statistics emanating from the Honduran government saying that the crime rate has gone down. We have no independent verification of the crime rate going down at all. We are almost entirely dependent on Honduran government statistics, which should not be trusted in any way. Similarly, the US State Department keeps saying that the Honduran National Police have been purged, but that is also not to be trusted. Very dangerous figures are still at the very top of the Honduran police, including those with documented human rights abuses that remain in leadership positions. Only about fifty cases have apparently been turned over to the attorney general’s Office; those who have been “cleaned up” are still walking free. The government is continuing to repress basic human rights. The space for democratic dissent shut down dramatically this fall even further, international observers are not being allowed to enter the country or are being deported, and government attacks on prominent human rights figures in the country have escalated. In that context, the statements we’re getting from the US Embassy in Honduras and the State Department are at best mealy-mouthed appeals to peaceful processes, at worst veiled signals that “outside interference” should be eschewed. They certainly are not condemning repression and violence committed by security forces, such as the use of live bullets and tear gas against peaceful protesters. There hasn’t been a peep about the civil liberty issues. Earlier this week at the State Department briefing, when asked about the certification of the human rights conditions, the spokesperson basically said what was done was done — evidently meaning, the debate was over. That is not a good sign. The embassy is evidently now sending out the message that there should be negotiation or dialogue, equating the two sides. The notion that the answer is some friendly dialogue is deeply disturbing. One side controls the whole state apparatus — the ballots, the military, etc. — while the other side controls none of those. It’s like saying the chickens are supposed to negotiate or have dialogue with foxes over who is going to control the chicken coop. What has the response been from members of the US Congress and the English-language media to the recent developments? The congressional response, led by Senator Patrick Leahy, has been terrific. He put out a powerful statement questioning the electoral process and condemning the repression. Congresswoman Jan Schakowsky had a stunning op-ed in the New York Times right before the election. Since then, she has been putting out statements and also been on Democracy Now!, and been articulate and forceful about the situation in Honduras. Rep. Keith Ellison has been speaking forcefully, too, and many others in both the House and Senate. This all has been really beautiful to see, Congress putting pressure on the State Department. The problem now is whether the State Department has been listening. This congressional outrage and concern, in turn, is in response to tremendous grassroots pressure and advocacy all over the United States, and that’s been amazing to see. Another important factor in this has been the English-language media coverage, which, overall, has been excellent in contrast to much of the past. First of all, Honduras is being covered daily by the big papers and news services. Some of it has been really terrific. Nina Lakhani has had some excellent coverage of Honduras for the Guardian. Elisabeth Malkin at the New York Times has also been writing beautiful pieces. We’re seeing all kinds of interesting things coming from unexpected places, like the Financial Times quoting Congresswoman Schakowsky. There are also dark spaces in this, such as Reuters, which at times, supports Hernández, although it has also done some important coverage. And then there’s Mary Anastasia O’Grady, who is always flinging things from the far right in the Wall Street Journal. What’s really amazing is how attentive the mainstream press has been to the repression, the fraud, and what the Honduran people are saying. That’s been very moving. It’s also a sign of the delegitimization of Hernández’s regime and all the work that has been done for years to point out how corrupt he is, his alleged ties to drug traffickers, and how he stole as much as $90 million from the Honduran people. A lot of this stemmed from the murder of renowned environmental rights activist Berta Cáceres in May of 2016. Her assassination reverberated around the world and led to a tremendous amount of education about not only the corruption within the Honduran government, but also the role of Honduran military and elites in allegedly committing her assassination. All of that is converging here in this very interesting synergy, something that is very new. Looking ahead, what are the ramifications likely to be of this highly contested and very likely fraudulent election? At this moment, we just don’t know who is going to win. There is a real possibility that Nasralla could be allowed to win if there was a true recount of all the votes with independent international oversight, as people have demanded. But we’ll never know — way too much time has passed, in which the ruling party could destroy ballots, mess with computer files, and commit all kinds of fraud. We need to support the call now emerging for an entirely new election, overseen by international bodies, without interference from the Honduran government or the United States. Meanwhile, we have to help the Honduran people as they express concern about any recount still controlled by the Honduran government. The other possibility, of course, is that Hernández is declared to be the winner. He in fact already announced himself as the winner the day after the election. This scenario would likely result in tremendous repression and crackdowns, including against the police who rebelled. I think there would be a big wave of assassinations. It would be truly terrifying. If Hernández somehow gets declared the winner, he’s going to be very de-legitimated because there has been so much international attention to the repression, the fraud, and what the Honduran people are saying they want. The Honduran people are speaking eloquently and bravely all day, every day. This is going on all night too, as the people are violating the curfew and banging pots and pans at scheduled times in the middle of the night. There are all sorts of ways in which people are trying to express their grief and outrage over the situation. The question is the international pressure. One of the wild cards here are the gangs and the drug traffickers, who work very closely with the ruling government and its security forces. What’s their role here? There have already been suggestions that they are working with the ruling party to loot and burn things to make it look like the opposition did it. What happens to all those drug traffickers who are interlaced with the very top of the government? What happens to the gangs if Hernández doesn’t win? What about security forces? Will they obey Nasralla if he wins? And then of course, what is the role of the United States in all of this? Above all, the biggest question is whether or not the Honduran people will be allowed to have a democratic election, will be allowed to speak out against dictatorship and state terror, and which side the United States is on as that question gets resolved.